The visceral depths to which the second of the Goodman Theatre’s fall productions descends are places best left masked by day-to-day naïveté, by dull dry routine, and by the numbing reality of merely getting by. These are places that, like an anchor of dense wrought iron attached to the hip, Anne Kauffman’s production of Noah Haidle’s hauntingly beautiful Smokefall plunges the audience member into. It encases its audience in an existential angst, thick beyond escape, and twists one’s guts with the pronged tool of an unfamiliar, penetrating fear. Upon arriving at the Goodman, the theater aficionado will discern—from settled deeply beneath the cool still air in his cushioned seat—that the set is gorgeous. It perfectly mimics the warm rooms of a lived-in house. They are familiar: This is the kitchen, complete with trimmed-down table and quietly empty chairs. There is the living room, next to stairs that lead to bedrooms and beyond. Here is the front door, true to wood-and-glass art deco style. The kitchen has green-tinged appliances set side-by-side with slightly ornate darkly wooden cabinets. Refrigerator and countertop surround a spindle-legged table. Four lean breakfasting chairs wait invitingly just left of center stage. Moss-green carpeting climbs the stairs and marks the setting as mid-century America. 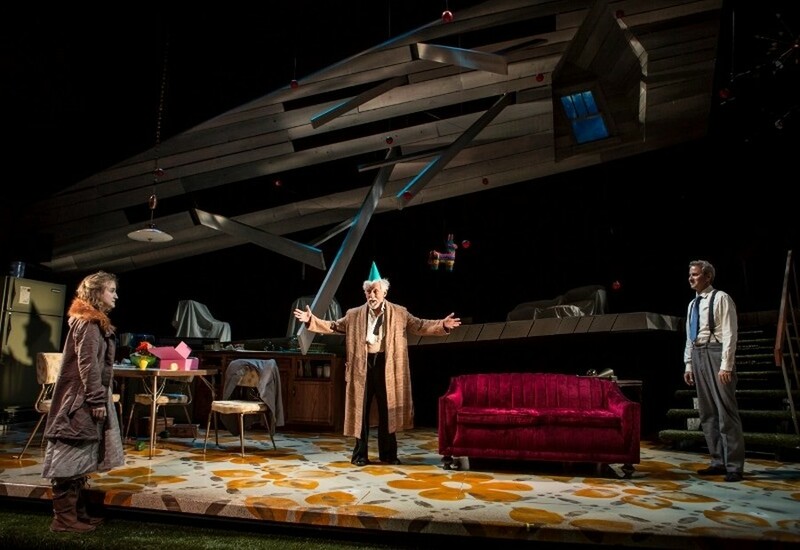 The elevated bedroom set behind sits placidly at a striking angle, cutting maybe 20 degrees into the base of the stage and shooting upward, back and to the right of the audience’s vision. The visual style is striking. The arrangement is functional, elegant; it is anticipatory of the sharply jagged direction the play will take. Thank AMC’s Mad Men for the haunting familiarity of the set. Thank that show also for your familiarity with the stricken families and alienated individuals that characterize the popular vision of mid-century, suburban post-war America. The stage is populated. Narrator Footnote (played by Guy Massey) describes the play’s activity with a dry humor that agrees with the audience, if the laughter is any indication. Violet (played by Katherine Keberlein) prepares breakfast and plays host to Daniel (Eric Slater), her husband, and the comedic Colonel (star Mike Nussbaum), her father. Troubled daughter Beauty (played by the incredibly talented Catherine Combs) joins silently. She will be key to the project of the play. Good mid-century family life ensues. Daniel is stricken existentially. His wife Violet is pregnant with twin boys. He loves his daughter Beauty, but she hasn’t spoken in three years. He is troubled at the prospect of John and Samuel, whom he whispers to through the bulge of his wife’s swelling stomach. They will be born into this world, the world that Daniel loves so much that—though he yells at his wife nightly—he is compelled to wake in the morning and trudge to and from the office with a kind of fervent, religious asceticism. Commendable, but it masks a deeper festering wound. The twins in the womb are best friends; they love each other more than they will love any thing or person ever, in real life or beyond. And they are fear-struck: Notice how difficult it is to throw oneself out of the warmth of the womb into this, our cold world. They comfort each other though: "You go first," "Hell no, you’re the first to go," "No bloody way," "You have to," "Fine, I’ll jump first, but you’ll follow immediately OK? I’ll feel the air moving between us as your body works to catch up to mine," "OK, absolutely." They’re doomed, and so are we. The second twin chokes on the grip of the umbilical cord around his neck. He is hung. We are left empty. The story is a mass of shadows. What do you do at intermission after that? The play is redemptory in small ways, if not for the genius of its performances than at least for the utter beauty of its staging. Still, Noah Haidle must have some real hope for man, or some small hope for the existentially ostracized individual. "What is a life?" he asks. The answer: The warmth felt only when it is shared with another.